The attack on Pearl Harbor and beginning of the Pacific Theatre in World War II, coupled with Japanese threats to the west coast of North America and the Aleutian Islands, changed the priorities for both nations. 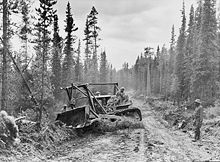 On February 6, 1942 the construction of the Alaska Highway was approved by the United States Army and the project received the authorization from the U.S. Congress and President Franklin D. Roosevelt to proceed five days later. Canada agreed to allow construction as long as the United States bore the full cost, and that the road and other facilities in Canada be turned over to Canadian authority after the war ended. The official start of construction took place on March 8, 1942 after hundreds of pieces of construction equipment were moved on priority trains by the Northern Alberta Railways to the northeastern part of British Columbia near Mile 0 at Dawson Creek. Construction accelerated through the spring as the winter weather faded away and crews were able to work from both the northern and southern ends; they were spurred on after reports of the Japanese invasion of Kiska Island and Attu Island in the Aleutians. On September 24, 1942 crews from both directions met at Mile 588 at what became named Contact Creek, at the British Columbia-Yukon border at the 60th Parallel; the entire route was completed October 28, 1942 with the northern linkup at Mile 1202, Beaver Creek, and the highway was dedicated on November 20, 1942 at Soldiers Summit. The needs of war dictated the final route, intended to link the airfields of the Northwest Staging Route that conveyed lend-lease aircraft from the United States to the Soviet Union. Thus, the rather impractical, long route over extremely difficult terrain was chosen. The road was originally built mostly by the US Army as a supply route during World War II. There were four main thrusts in building the route: southeast from Delta Junction, Alaska toward a linkup at Beaver Creek, Yukon; north then west from Dawson Creek (an advance group started from Fort Nelson, British Columbia after traveling on winter roads on frozen marshland from railway stations on the Northern Alberta Railways); both east and west from Whitehorse after being ferried in via the White Pass and Yukon Route railway. The U.S. Army commandeered equipment of all kinds, including local riverboats, railway locomotives, and housing originally meant for use in southern California. Although it was completed on October 28, 1942 and its completion was celebrated at Soldier's Summit on November 21 (and broadcast by radio, the exact outdoor temperature censored due to wartime concerns), the "highway" was not usable by general vehicles until 1943. Even then, there were many steep grades, a poor surface, switchbacks to gain and descend hills, and few or no guardrails. Bridges, which progressed during 1942 from pontoon bridges to temporary log bridges, were replaced with steel bridges where necessary only. A replica log bridge, the Canyon Creek bridge, can be seen at the Aishihik river crossing; the bridge was rebuilt in 1987 and refurbished in 2005 by the Yukon government as it is a popular tourist attraction. The easing of the Japanese invasion threat resulted in no more contracts being given to private contractors for upgrading of specific sections.